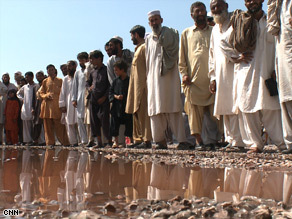 ISLAMABAD, Pakistan (CNN) -- Civilians continued to flee Pakistan's northwest in droves Monday as government troops prepared to engage Taliban militants in the crisis-hit Swat Valley. Thousands of displaced Pakistani civilians have flooded refugee camps. More than 360,000 Pakistanis have fled their homes since May 2, the United Nations has reported. "Obviously more people are on the move," said Ariane Rummery, a spokeswoman for the U.N. human rights commissioner. "Not everyone is registered." Thousands of vehicles fled Swat Valley on Sunday, where up to 15,000 Pakistani troops are preparing to move against approximately 5,000 Taliban militants, a regional official said. The military has been releasing regular reports saying it has killed Taliban militants in the region, but it has produced little evidence of the successes it claims. Journalists have not been permitted to observe the offensive and the army has not shown bodies of the militants it says it has killed. Curfews have been imposed in the conflict zone, but are relaxed periodically to allow civilians to travel. It is not unusual now to see rickshaws and cargo trucks filled with fleeing civilians, rolling down Pakistan's main east-west highway. Vehicles are not allowed back into the region, which has led to a shortage for those trying to leave. Meanwhile, at least 25 boys stranded at the Khpal Kor Foundation orphanage in Swat Valley had to flee the district capital, Mingora, on foot Sunday, according to director Mohammed Ali. He said local government officials told him there were no vehicles to evacuate the children. The 175-kilometer (110-mile) journey from Mingora to the western city of Peshawar normally takes about three hours by car. The boys walked for several hours, but had to spend the night in a madrassa -- a religious school -- outside of Mingora, because authorities had re-established the curfew. Camps for the displaced have sprouted up throughout the country's northwest, with hospitals and humanitarian groups struggling to keep pace. In other developments, a suicide car bomber attacked a Pakistani paramilitary checkpoint outside Peshawar on Monday, killing a Frontier Corps soldier and three civilians, said Ali Sher Khan, a Corps spokesman. Troops fired on the suspicious vehicle as it approached, according to Khan.